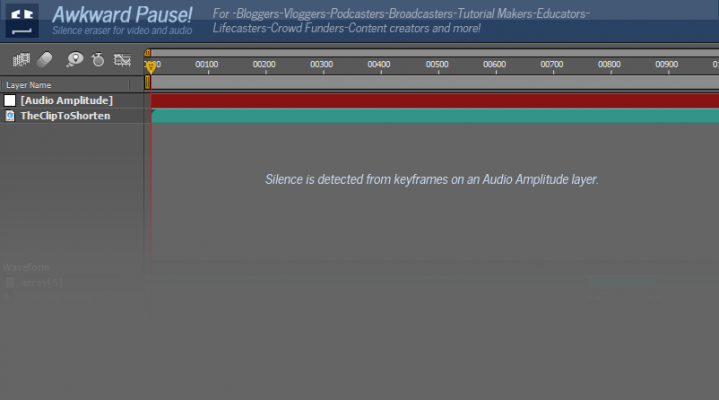 Awkward Pause is a one click solution to detect silences in video/audio and erase them. 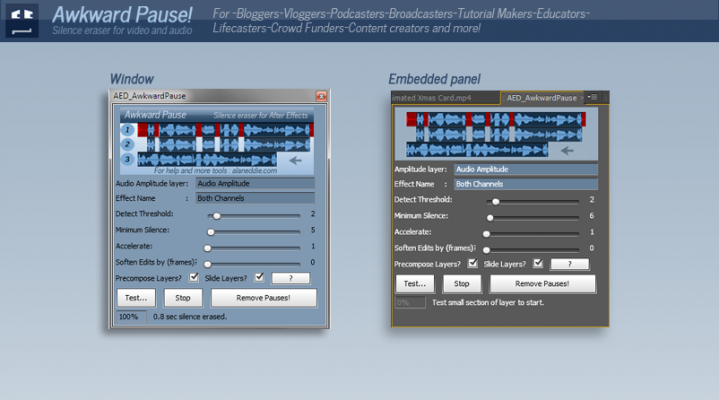 Useful for Bloggers-Vloggers-Podcasters-Broadcasters-Tutorial Makers-Educators-Lifecasters-Crowd Funders-Content creators and more! 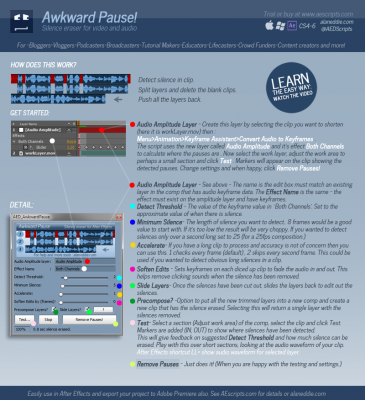 Awkward Pause is a one click solution to detect silences in video/audio and erase them. Record your video, pause to think, go slow and be succinct. 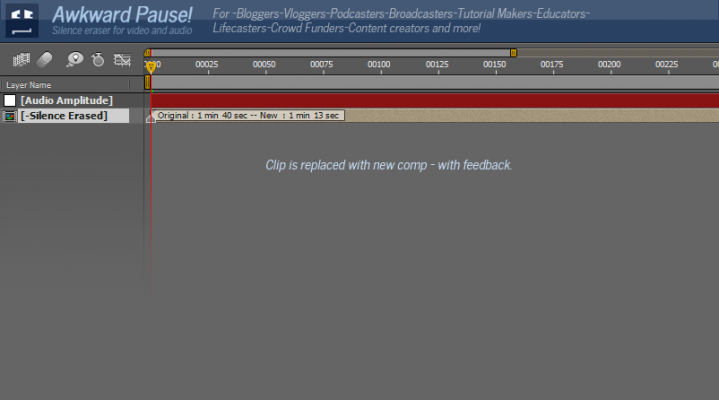 After the fact - process the clip with Awkward Pause and make your clip flow eloquenly once the pauses are eliminated. Take your time recording your clip, Simply pause where you would like to edit out later. 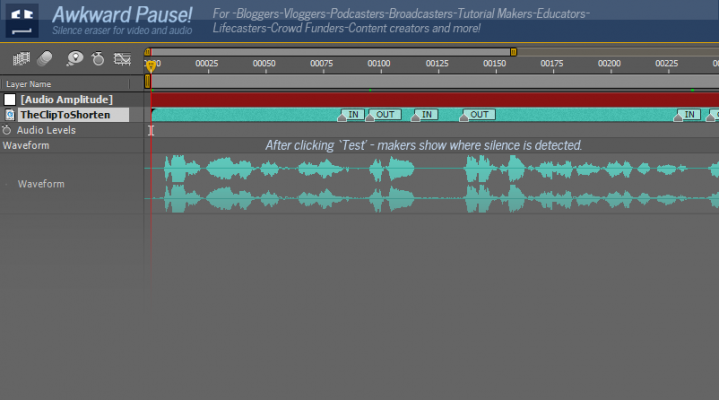 After the fact - process the clip with Awkward Pause and make your presentation flow eloquently once the pauses are eliminated. In an increasingly long-winded world - hold the attention of your audience by condensing down the length of your video/audio clip. Example use: reduce length of your video by eliminating tiny pauses between words and sentences. Example use: Don't do multiple takes, just pause and use this to detect pauses longer than a few seconds, and erase them. 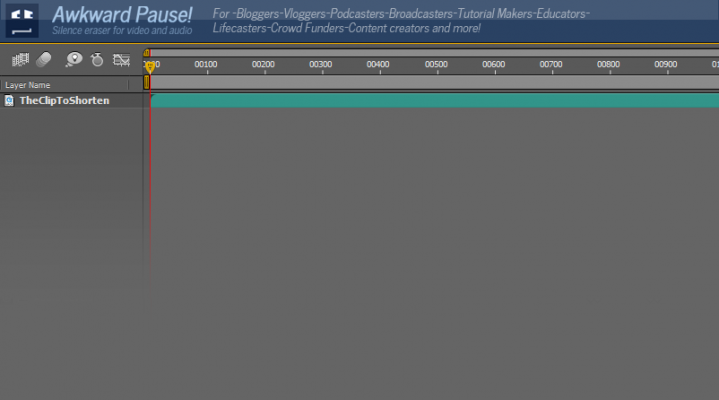 Bloggers-Vloggers-Podcasters-Broadcasters-Tutorial Makers-Educators-Lifecasters-Crowd Funders-Content creators and more! This is a plugin/script for After Effects. However if you use Premiere, it's easy to use inter-operationally with After Effects - see video below. 1.21 - Fixed bug that prevented running in languages other than English. 1.21 - Minor UI fixes and licensing updates. 1.22 - Fixed UI remembering settings between sessions, so you don't have to readjust. 1.2 - Fixed bug that prevented running in CC 2015. Now compatible with CC. Are you a messy motion graphics artist? Sort your project panel, nice and neat. Arranges project items into folders based on a matching prefix. Focus on the layers you want. Simple - isolate layers you are working on. 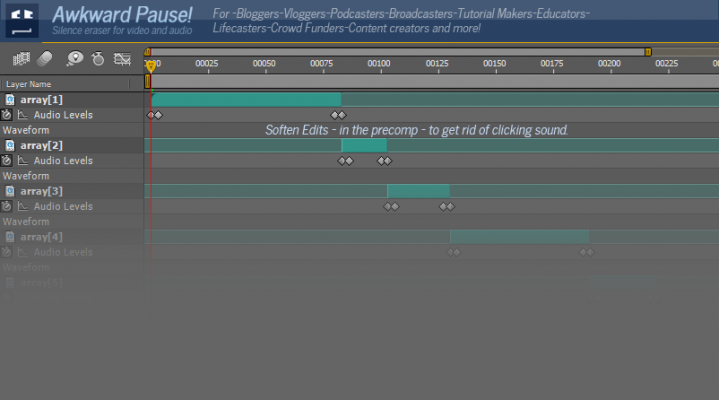 Click = Isolate | Alt Click =Isolate in timeline with solo | Shift Click= Isolate layers based on label colour (CS5+). 3 bugs appear in comp - Isolate,Isolate with Solo and Isolate by color. Finally, create Photoshop style groups directly in the timeline. Comprehensive functionality to mimic how Photoshop handles groups. One of the most requested features in After Effects. Now with Group Mattes, Isolate layers and Baking of Groups into pre-comps.